This lovely country park has grown in popularity over the years, but it has retained it's wonderful country charm. 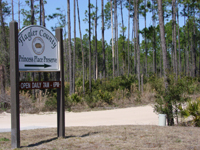 We have visited Princess Place Preserve many many times over the years. We have camped there with the Boy Scouts, attended the Creekside Festivals, and more. Sometimes we are lucky and get to visit with the visiting horses and their people, in the horse staging area next to the "Hill" campground. They say that the trails throughout the park are just excellent on horseback! We have camped there on numerous occasions with the Boy Scouts. Just last weekend we were there, and I was able to get some video and pictures of the beauty I see there. Wildlife are abundant there too. I saw opposum, raccoon, armadillo, deer. I have heard pigs and a bobcat once growled at night while we were camping!! Someone mentioned to me also, that a nest of bald eagles had just hatched on Hominy Trail, and they were being carefully observed. The best family camping available by permit is located at the "docks" which is an excellent location right on the creek leading to the Intracoastal Waterway, so you can fish, and also you can bring your kayak or canoe, and launch it right there at your campsite. I love to go there to get away from it all, and to walk the trails and to see the Princess House on the water.